PARIS — The Turkish government's ambitions to become a force in satellite Earth observation took a step forward on Dec. 19 with the successful launch, aboard a Chinese rocket, of the Turkish Gokturk-2 medium-resolution optical surveillance satellite. Turkish officials said the 400-kilogram Gokturk-2, made mainly in Turkey but with an optical imager provided by South Korea, was safely in orbit at nearly 700 kilometers in altitude and had sent signals to a ground station in northern Norway. The satellite was launched aboard a Chinese Long March 2D vehicle operated from the Jiuquan Satellite Launch Center in Gansu Province. 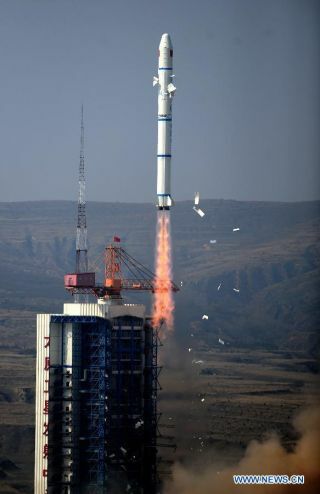 It was the 19th launch of a Chinese Long March rocket, all variants included, for 2012 — a year Chinese launch service officials had forecast would be particularly active for the rocket line. Rasat has a ground resolution of about 7.5 meters, meaning it can detect objects of that diameter and larger. Gokturk-2 has a 2.5-meter resolution and includes 15 gigabytes of image storage capacity. Turkish Science, Industry and Technology Minister Nihat Ergun said before the launch that Gokturk-2 should be seen as an investment in high technology, and a signal of Turkey's determination to have its own, restrictions-free use of Earth observation imagery. Turkey's defense forces have purchased another Gokturk satellite from Telespazio of Rome and Thales Alenia Space of France and Italy. This 1,000-kilogram spacecraft will be similar to the two French Pleiades satellites now in orbit, with a 70-centimeter ground resolution in black and white and 2.8 meters in color. The satellite's development has taken longer than expected, and it is not expected to be launched before late 2014. Telespazio's contract, valued at 250 million euros ($325 million) when signed in 2009, includes establishing a satellite integration and test facility in Turkey as well as a Gokturk ground station. Thales Alenia Space and Telespazio are thus doing for Turkey what rival Astrium Satellites of Europe is doing for Kazakhstan in providing a satellite, a training regime and an initial satellite test facility to a nation that has made clear it ultimately wants to be able to build satellites of its own. The Turkish Scientific and Technological Research Council and Turkish Aerospace Industries built Gokturk-2. Ergun said the entire Gokturk-2 project is valued at 140 million Turkish Lira ($79 million).